Word on the street is that Bloomberg loves hippies. So now, finally, a drum circle you don’t have to be high to enjoy: this Sunday at 2pm, for 24 hours, bring the love to Mayor Bloomberg’s personal townhouse: 17 East 79th Street. Tie-dye, didgeridoo, hackeysack welcome! No shirt, no shoes, no problem! And if you don’t have talent, don’t worry: FREE DRUM LESSONS offered! Also on offer: collaborative drumming with the police! Even though this is a 24-hour drum circle, don’t be late! The mayor loves evictions. Who knows what’ll happen? But no matter how long it lasts, there’ll be an afterparty and love-in in world-famous Central Park just next door. Anorak loves a protest – it’s a rection – a thought – made real. But drumming in a circle is horrible. Utterly horrible. No-one wins. 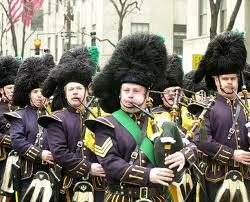 Anorak has one top for Mayor Bloomberg: bagpipes, specifically the 112 members of the Emerald Society of the NYPD. Run now, Occupy Drummers. You cannot win. In Musical Trumps, Bagpipes always wins.